It’s getting chilly outside, and while warm comforting food is high on the crave-list, it’s more important than ever to keep eating salads, brimming with healthy nutrient-rich vegetables and grains. The good news is that the cooler weather gives us an excuse to fortify our salad bowls, transforming the light and wispy summer salad into a healthy hearty autumn bowl. 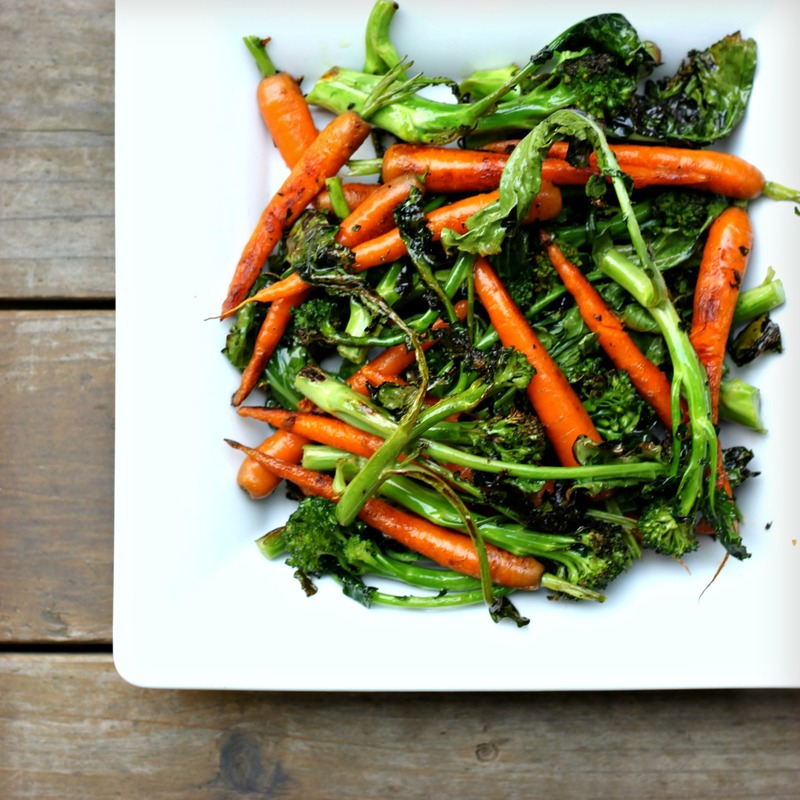 A key ingredient in this cold-weather salad is nutrient-rich kale. Raw kale can be bitter and difficult to digest in large quantities, so it’s important to tame the tough and sturdy leaves to deter picky eating. This can be easily accomplished by massaging them. Yep, that’s right: Drizzle the kale leaves with a little lemon juice, olive oil, and a pinch of salt, and then rub them for a minute or so to coat the leaves. You will be rewarded with a slightly softened version of the hearty leaf, that’s not only easier to munch on, its earthy flavor will be softened by the lemon and salt. Treat this salad just like your fall wardrobe, and pile on the layers – it can handle it. I’ve added finely chopped cauliflower and dried cranberries, along with a shower of quinoa and seeds. Because these salads are so sturdy, they hold up well and don’t mind a little standing once they are fully dressed – which is great for do-ahead assembly. 1. In a large bowl, rub the kale leaves with the lemon juice, olive oil, and salt until thoroughly coated, about 1 minute. Let stand for 15 minutes. 2. 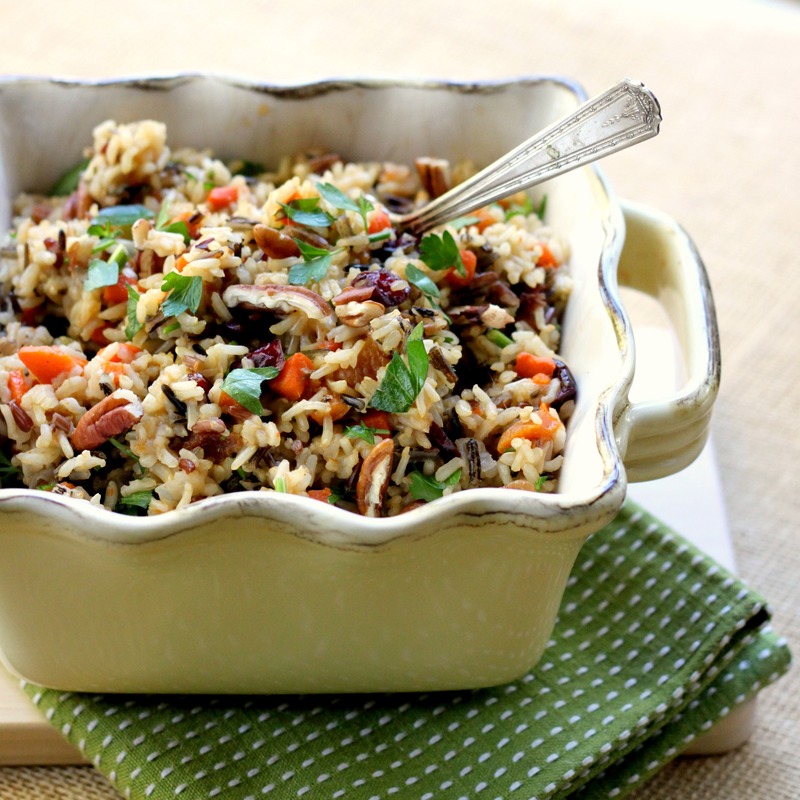 Add the scallions, carrot, cauliflower, quinoa, parsley, and cranberries and toss to combine. 3. Make the dressing: Whisk the oil, vinegar, lemon juice, garlic, mustard, salt, and pepper in a small bowl. Drizzle over the salad and toss well to thoroughly combine. Garnish with the pepitas. Serve immediately or cover and refrigerate for up to 2 hours. Have you been tasked with bringing a spring-y platter of food to feed a crowd for Easter brunch this weekend? I made this sunny salad for an Easter brunch last year. It’s a lovely way to serve asparagus; and prosciutto; and egg. There is not much else you need to add to this trio except a few squirts of fresh lemon and a splash of olive oil to coat and glisten. If you can get your hands on a bunch of baby greens, then use them as a bed for the asparagus to absorb the oil and lemony goodness. And if you have a few baby herbs unfurling their leaves in your garden, by all means, add them to the plate. Heat the oven to 375°F. Spread the asparagus on a rimmed baking sheet. Drizzle a little olive oil over the asparagus and turn to coat. Season with salt and pepper. Roast in the oven until the asparagus are bright green and crisp tender, 10 to 12 minutes, depending on the thickness of the stalks. They should be crisp tender and not too floppy (unless you like them that way; then cook a bit longer). Remove from the oven and transfer to a plate to cool. Keep the oven on. Arrange the prosciutto on a baking sheet lined with parchment. Bake in the oven until shriveled and firm to the touch, about 15 minutes. Remove from the oven and cool to the touch. The prosciutto will continue to harden as it cools. When cool enough to handle, break into shards. Spread the greens on a serving platter. Arrange the asparagus over the greens. Squeeze the juice of the lemon over the asparagus and greens and drizzle with a little oil. 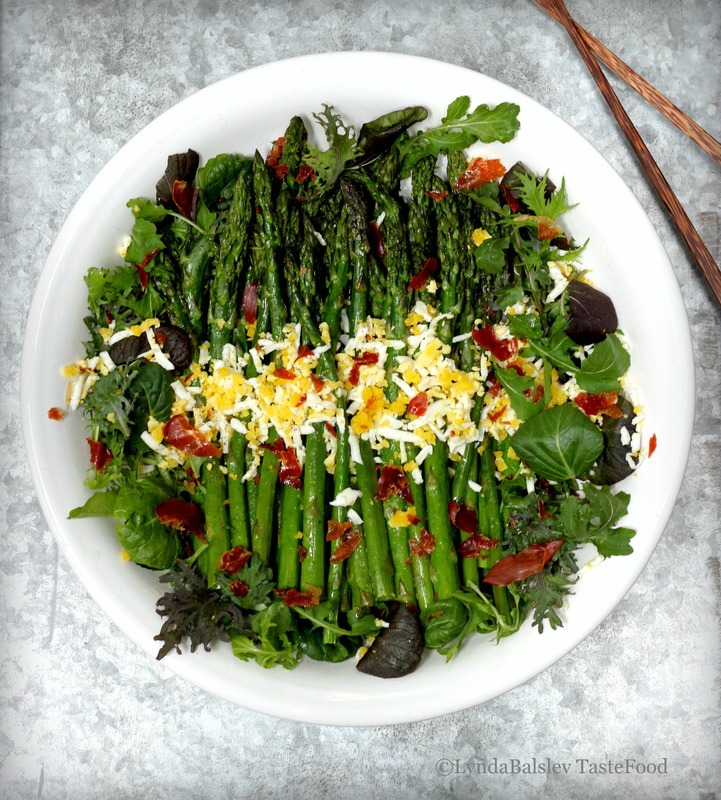 Grate the eggs over the asparagus, then sprinkle the prosciutto shards over the salad. Garnish with fresh black pepper. If you have any fresh herbs in the garden, such as parsley, chervil or mint, feel free to tear a few leaves and scatter over the salad as well.